Since ancient times, various dance forms of Andhra Pradesh have enriched the cultural heritage of the state. 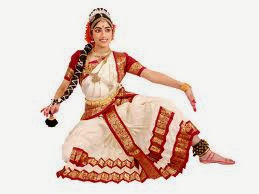 In addition to Kuchipudi which is the classical dance of Andhra Pradesh, the state in rich in other dance forms like the semi-classical dances, folk dances and tribal dances. But unfortunately, due to various reasons some of these dance forms are fading away and it is time for the Telugu people to understand the same and revive those dance forms to bring back the past glory of the rich art and culture of the state. 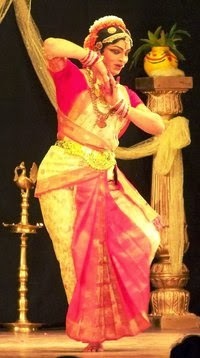 Kuchipudi is the most popular classical dance form of Andhra Pradesh. The dance derived its name after a small village named Kuchipudi in Krishna district. The dance was revived by a gifted teacher name Siddhendra Yogi who formulated the classical dance form. Kuchipudi is generally themed on mythology but in the recent times even social themes are taken into consideration. Mridangam, Saraswati Veena, Violin, Flute, Manjira (small hand cymbals) are the main musical instruments required for the dance. Occasionally Ghatam (percussion musical instrument made of earthen pot), Kanjira and Tambura(Tanpura) and Sruti pette (Surpeti) are also used as an accompaniment. 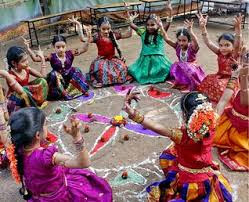 Andhra Natyam is also one of the ancient traditional dance forms of Andhra Pradesh which originated as a temple dance. Due to various reasons the dance form was banned and was at the verge of disappearing. Around 50 years ago, the dance form was re-introduced and re-named by the most profound contributor Padmasri Acharya Dr. Nataraja Ramakrishna. Andhra Natyam has a striking resemblance with Bharatanatyam and Kuchipudi. It is considered as a blend of these two dance forms. After its re-introduction, the hard efforts of Acharya Kalakrishna who is a leading exponent of Andhra Natyam and a foremost disciple of Padmasri Acharya Dr. Nataraja Ramakrishna, helped in bringing back the past glory and fame of this dance form. Musical instruments like Mridangam, Saraswati Veena, Violin, Flute, Manjira, Sruti Pette and Kanjira are used in accompaniment with the dance. Perini Siva Tandavam is one of the excellent dance forms of Andhra Pradesh which is performed vibrantly by the performers. It gives a real entertainment to the audience by captivating them. This is a semi-classical dance form which Warrior-like Dance to invoke the Veera (valour) and Raudra (wilderness / anger) rasas of Lord Shiva. The dance is performed in the worship of Lord Shiva before entering into the war field hence the dance begins with a Gargara and concludes with Shiva Panchamukha Sabdha Nartana. The performers dance vibrantly to the rhythmic beats of drums, sounds of bells and conch reverberating the entire surroundings with a war-like situation. This makes the audience spell-bound and enthralled. The dance is performed by male dancers only. It was patronized during the Kakatiya Dynasty in Warangal (in the state of Telangana after bifurcation of combined Andhra Pradesh). The dance form was re-introduced by Padmasri Acharya Dr.Nataraja Ramakrishna. Besides worship to Lord Shiva, the dance also involves the worship of Pancha Bhoota or the five elements viz. Pridhvi (Earth), Jal (water), Agni fire), Vayu (air) and Akash (space / ether). Veera Natyam also known as Veerabhadra Nrityam is one of the ancient dance forms of Andhra Pradesh. It seems to have its origin in Draksharamam in the East Godavari district which is believed to the the place of Daksha Vatika where the outraged Shiva created Veerabhadra from his Jata-juta (a strand of hair) during Daksha Yagnam due to humiliation to his wife Sati Devi. Lord Shiva being the King of Dancers (Nataraj) believed to have performed Veera Natyam. A minor community by name Veera Musti in Draksharamam claim themselves to be the descendants of Veerabhadra. The people of this community perform Veera Natyam vibrantly with Trident (Soolam) and step rhythmically to the tunes of Tambura (Tanpura), Dolu (a percussion instrument), Thasha and Veeranam. This folk dance is mainly performed by the males. It has its roots in the East and West Godavari districts, it spread to the districts of Kurnool, Ananthapur, Warangal and Khammam as well. 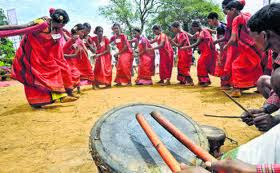 Tappeta Gullu is one of the most popular folk dances of Andhra Pradesh which was originally performed by the local shepherds to invoke and appease Gangamma Talli (water) to bring down rains. The dance is performed by the male performers and is much in practice in the North coastal districts of Srikakulam, Vizianagaram and Visakhapatnam. This is a lively dance performed by a group of 12 to 30 male members who hang down dappulu (flat drums) from their necks to beat these rhythmically while performing breath-taking acrobats. The rhythmic beats of the drums combined with the melodious sound produced by the musical ankle bells tied to their ankles thus filling the entire atmosphere with vibrant beats. 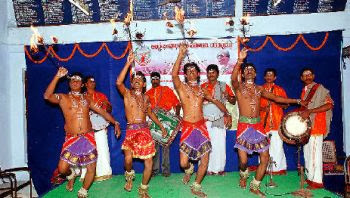 Butta Bommalu is one of the most popular folk dances of Andhra Pradesh that was born in Tanuku in the West Godavari district and fostered in the East and West Godavari districts. This is basically a mask dance in which the dancers wear huge hollow basket (butta) like masks on their heads and tie these firmly over their waists. These hollow basket-like masks are light in weight and are made of eco-friendly like thin stripes of bamboo that are woven into a round basket-shaped figures which is smeared with a paste of tamarind seeds. These masks are also made of saw dust, dry grass and cow dung. Mostly these masks are based on mythological figures like Lord Rama, Hanuman, Ravana etc and the dance is usually performed during festive occasions and social events. Kolattam is the most popular folk dance of Andhra Pradesh which is the favorite dance of the Telugu people. The dance is mostly performed by the school children in the school cultural events in which a group of dancers either pair up or form a circular path. This is a prop dance in which compulsorily a pair of decorated wooden sticks are held by the performers in each hand. They keep striking the sticks with the self and alternately with their partner or with the adjacent dancer rhythmically to the tunes and thus produce harmonious sound which reverberates the surroundings. This dance is much enjoyed and applauded by the audience. Kolattam is an ancient traditional folk dance of Andhra Pradesh which is performed both by men and women. This is basically a harvest dance which is performed by the women farmers who spend time in the fields. There is another attractive, artistic and skilled Kolattam in which the dancers artistically weave ropes like the plaits of hair. In this dance one end of the ropes is fixed to the ceiling while the other end of the ropes is tied to the sticks that are held by the dancers. When the dancers move in a definite circular path and the ropes are artfully woven by the dancers. And the costume of the dancers is the typical traditional dress of Andhra Pradesh called the Perikini Vani or Parikini Jackattu or the typical way of wearing sari by the folk women. 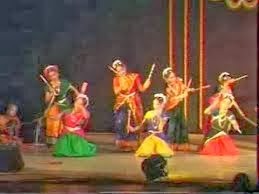 The dance mostly resembles dandiya dance of the North. 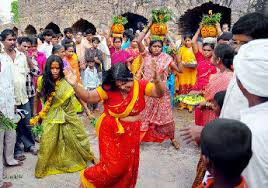 Gobbi dance is one of the most popular folk dances of coastal Andhra Pradesh which is performed only during the festival season of Bhogi and Makara Sankranti when the young village girls rejoice the onset of spring by dancing in a circular path round the muggulu / floral designs on the ground. Small round balls made of cow dung which are called Gobbillu in Telugu are placed on the rangoli which are decorated with marigold flowers / pumpkin flower and pasupu (turmeric powder) and kumkum are smeared on the gobbillu. 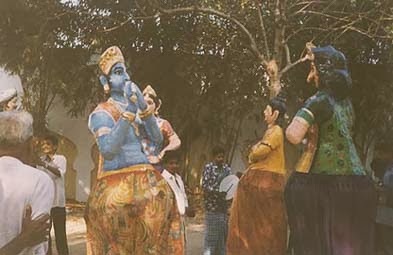 This folk dance has its roots in the coastal districts of Andhra Pradesh and in some regions, even a small idol of Lord Krishna is placed in the middle of the rangoli and the young village girls sing songs in praise of Lord Krishna or Vishnu and dance round the muggulu in a circular path by holding hands and alternately bending towards the center and then moving away from the center and clapping hands rhythmically. The dance somewhat resembles the Garba dance of Gujarat. Dappu is a Telugu word and it is a simple locally made percussion instrument made from the leather of goat. This is a typical musical instrument very commonly used in local fair (Jatara) and festivals. In fact a dappu is an integral part of the folk dances of Andhra Pradesh. 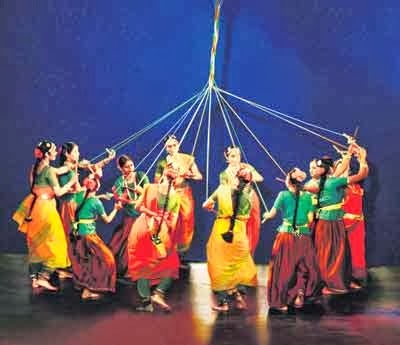 Traditionally, this is a group dance performed by the Harijan community in which the dancers place the instrument on their shoulders or hang it in front and beat rhythmically on it with two sticks which produce a vibrating sound. The dancers tie ankle bells and step rhythmically to the sounds. This lively folk dance has its origin in the Nizamabad district. Bonalu is a local harvest / folk festival of the Telangana. The women folk carry Bonalu / Ghatams on their heads. The word Bonalu is the shortened word for 'Bhojanalu' which means food in the local language. Bonalu are the earthen pots or brass pots that are smeared with turmeric paste and decorated with kumkum dots and neem leaves. The devotees go in a procession carrying cooked rice in these pots that are placed on their heads and dancing to the rhythmic beats. The devotees go to Mahakali temple or the local goddess temple to offer Bhojanalu or Bonalu to the goddess. The dance even involves male performers who are called Potharajulu, who walk in the procession and keep lashing whips. Bonalu is the most popular festival in Hyderabad and in the Telangana region. Puli Vesham which is the most local dance of Vizianagaram district in the North coastal Andhra Pradesh. 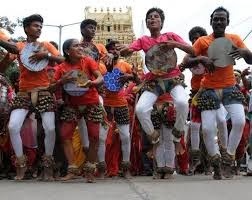 The dance is performed by the dancers during the famous Pyditalli Ammavaru festival - the local deity, which is celebrated on Tuesday succeeding Dussehra Dasami. The festival is known as Srimanu panduga which is witnessed by lakhs of devotees in the district. The dancers paint their bodies with yellow and black stripes like a tiger and wear a narrow strip of cloth round their waist with a long tail on the back. 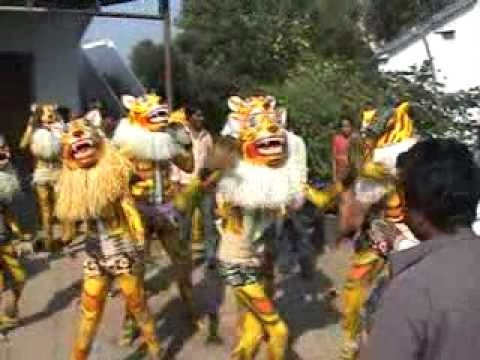 The dancers cover their head with a tiger's mask and dance vigorously to the beats of dappulu (a percussion musical instrument) by striding and jumping like a tiger. This is one of the most local ethnic traditional folk dance which is at the verge of fading away due due to modernization. Garaga dance is performed mostly by the male members who dance to the rhythmic beats of the Dappulu carrying Poorna Kumbham on their heads and go in a procession to the village main temple. This is mainly a religious dance that originated in the East Godavari District. Mostly the performers are the temple priests who carry decorated Poorna Kumbham which is a brass pot / vessel which is used as Panapattam in the Shiva temple. The Garaga represents Prakriti and Purusha. Chindu Bhagavatam is one of the age old popular performing art of North Telangana region particularly of the Nizamabad district (now in Telangana state). The dance is similar to Yakshagana - the classical dance form of Karnataka. The dance is performed by the people of socially backward castes who are called the Chindu Madigas - the Scheduled Caste. The word Chindu is derived from their caste Chindu and the performers are mostly nomads. They form a troupe who keep moving from one village to the other and after the performance collect whatever the villagers give them. The dancers mostly perform scenes from Hindu mythology and dance to the rhythmic music and songs of the troupe. The women folk too join as a chorus and keep beating talam during the play. 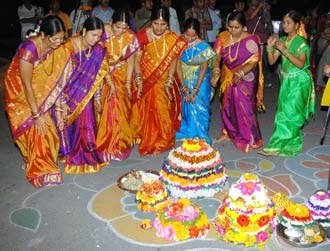 Bathukamma is an important religious festival celebrated in Telangana. The festival is celebrated by the women during Dussehra Navaratri days who worship goddess Bathukamma and seek her blessings for a happy and prosperous married life. The festival is unique in its own way as goddess Bathukamma is not enshrined in a temple but is made of colorful flowers and the women folk sing and dance round the colorful flower idol of Goddess Bathukamma. The festival is specially important for the newly married women. After the 9-day continuous festival celebrations, on the 10-day Bathukamma is carried by the women on their heads and is immersed in the local water bodies. In addition to the folk dances of different regions of Andhra Pradesh, even the tribes of the hilly regions of the state have contributed much in enriching the cultural heritage of the state. Each region of the state is unique in its own way and the tribes of the hilly regions have their own style of dance and music some of which have gained much popularity while others are at the verge of fading away. Dhimsa dance is the most charming and popular tribal dance of the Araku Valley in the Visakhapatnam district. 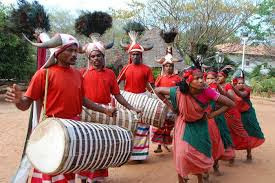 Various tribes like Valmikis, Konds and Bagatas live in this region and Dhimsa is a very ethnic dance of these tribes who perform the dance usually in the local fairs and festivals. Generally the dance involves a group of dancers who form a chain by joining hands together and move in a serpentine path. The male members support the dancers by playing music on typical local musical instruments like Dappu, Mori, Tudumu, Kiridi etc. 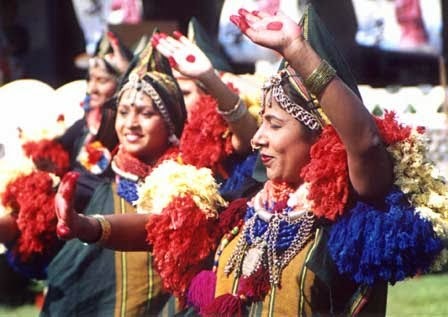 The dancers wear saris in their typical way and wear typical tribal ornaments. Even the hair style is in their typical tribal style in which the entire hair is knotted on one side and a big colorful flower is placed on the knot. The dance gives a real entertainment to the audience. Lambadi dance is one of the most popular tribal dance forms of the state which is performed by the Banjaras / Lambadis - a semi-nomadic tribe in the Telangana region / state. The dance has its roots in Rajasthan and is basically a harvest dance which is even performed in various social and religious occasions. The costume of the Lambadi tribe is very colorful and attractive which consists of heavy embroidery work with glass beads and mirrors and heavy jewelry consisting of broad ivory bangles, heavy brass anklets and huge hanging on the hair. The dance is accompanied with rhythmic beats on Dappu played mostly by the male members and songs which too have gained popularity are sung in a language blend of Telugu, Hindi and Marathi. Mathuri is a famous tribal dance which has its roots in Mathura and is performed by the tribes named Mathuris found in the Adilabad district of the Telangana region / state. 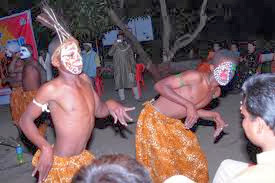 This particular tribal dance is somewhat similar to the Ras-lila dance of Uttar Pradesh. 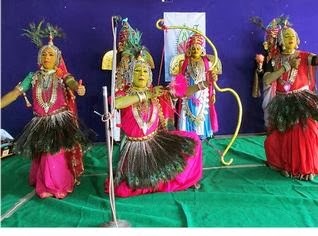 The Mathuri tribe seem to have migrated from Mathura in Uttar Pradesh and the dance is mainly performed by the male and female members on Sri Krishna Jayanti day in the Hindu month of Sravan. The dancers deck up heavily and sing devotional songs particular on Lord Krishna and the male dancers make a rhythmic beat with small sticks while the female singers perform various hand movements and clap their hands. The females perform slow dance while the males perform fast dance. Koya is a prominent tribe found in the remote hilly regions of Visakhapatnam and Srikakulam districts in the Eastern Ghats. The dance performed by this tribe during the harvest festival is known as the Koya dance. The dance is performed by both men and women who wear colorful and ethnic tribal costume. 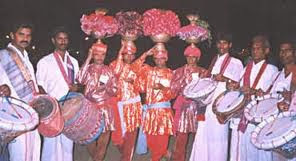 The main attraction of the dance is the Mayura Nritya or the Peacock dance that is performed by the males wearing crowns made of peacock feathers and holding a dolu / dhol (a local percussion musical instrument). 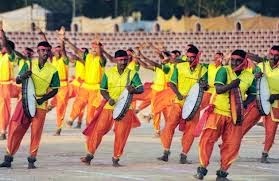 Dandaria dance is mainly performed by the Gonds - a prominent tribe concentrated in Central India in the states of Odisha, Madhya Pradesh, Chattisgarh and Telangana region of Andhra Pradesh. This is mainly a male dance in which the dancers use props which are long sticks and the dance involves a bit of martial arts. The performers are dressed in colorful special costumes move in circular paths. Dhamal is a traditional ceremonial dance of the Siddi community found in the Hyderabad region. Hyderabad is the capital of the newly formed state of Telangana. 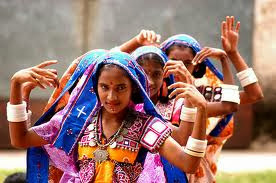 Siddi is a small community which has its origin in the African continent that migrated to India in the medieval period. There is a cultural assimilation and Siddhis have enriched the cultural heritage of the state with their fascinating warlike vibrant dance called the Dhamal. The dance is performed during special ceremonies and is accompanied by a good number of musical instruments. The dancers produce the verbal sounds of how. wow' along with the rhythmic body movements which makes the audience spell-bound. The dance very much resembles the African dance.